Signed as a free agent on Dec. 19, 2018. 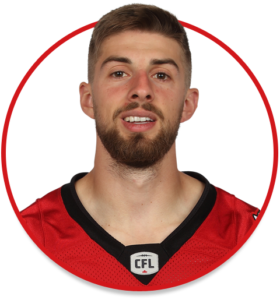 Klukas originally signed with the Stampeders on Dec. 7, 2017. He spent three months on the Calgary practice roster during the 2018 season before being released on Sept. 7, 2018. (Calgary) Klukas attended training camp and was placed on the practice roster to start the season. He spent a total of 10 weeks on the practice roster before being released. Klukas made 46 catches for 739 yards in eight games with the University of Calgary in 2017 and shared the team lead with seven receiving touchdowns. He had four 100-yard games including a season-high 129 yards and two touchdowns in a Sept. 16 contest against Manitoba. Over five seasons (2013-17) with the Dinos he had 82 receptions for 1,253 yards. Klukas also saw special-teams action with the Dinos and in 2015 he returned a punt 110 yards for a touchdown against UBC. Klukas is an alumnus of Calgary’s St. Mary’s High School. He also competed in basketball, hockey and track.